My daughter wanted a Beatles birthday cake for her birthday, so I made the Beatles from fondant. I painted on the faces by dipping a brush in to food coloring for the faces. 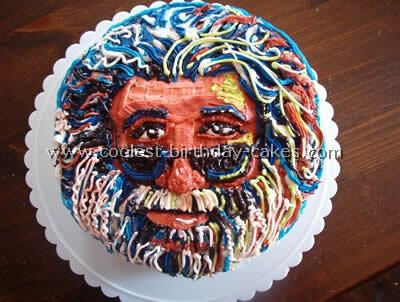 I had to use a tooth pick dip in the food coloring because I dint have a small enough paint brush. That was the hardest part yet amusing. The bus I carved out of cake, the wheels are fondant, the base of the cake I made different colored stripes with frosting then took a butter knife to drag the colors together. 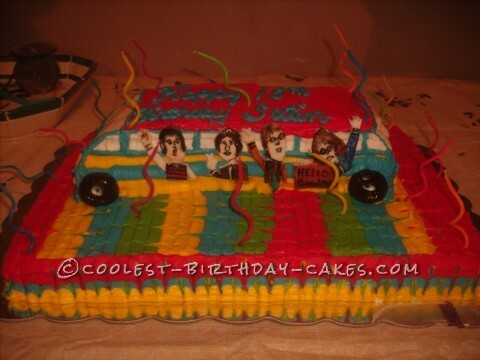 Everybody loved the cake and was very amused with the Beatles peering through the windows of the bus. Everyone was also impressed by the fact they could tell which character was who.